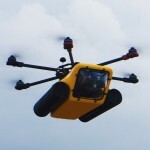 This HexH2O drone has a waterproof casing that gives you the ability to film underwater. 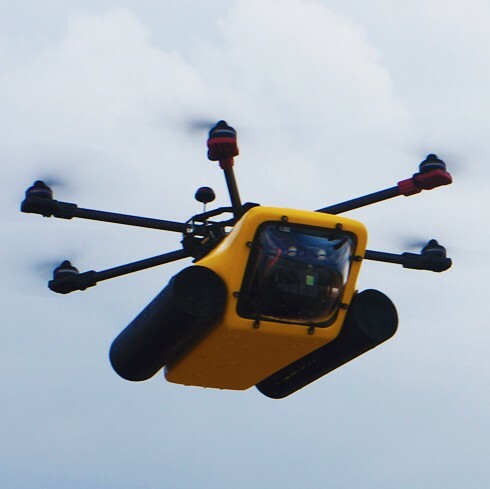 The hexacopter carries a Zenmuse-h3-3d Gimbal and Gopro so you can aerial footage both above and below the waterline. Their makers claim that the HexH2o™ is the worlds first waterproof production multirotor housing a gimbal. This should give you fully stabilised video from both above and below water. The drone is built with DJI components such as the Autopilot (DJI Naza V2 with GPS) and Propulsion system (DJI E600 Tuned Propulsion System).